They stand for truth, justice and the American way. They also stand inside of each other. 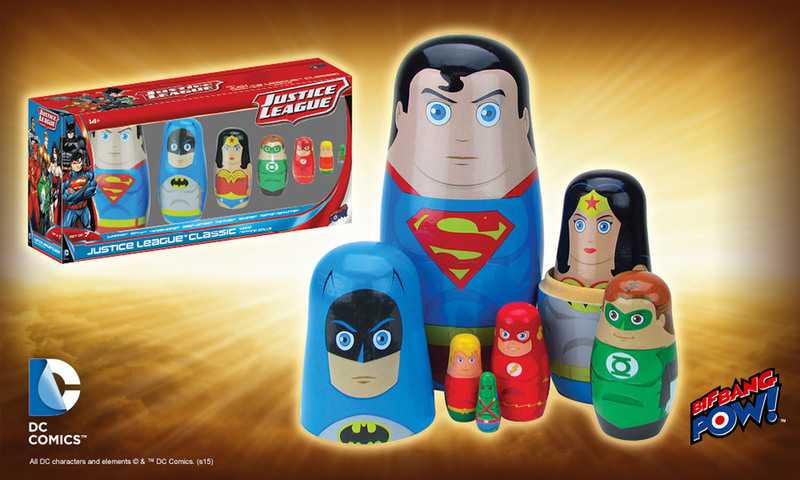 This DC Comics Justice League Nesting Dolls Set from Bif Bang Pow! is the perfect addition to your superhero toy collection. These real wood matryoshka look awesome and all of your favorite Justice league members are here. You get Superman, Batman, Wonder Woman, Green Lantern, The Flash, Aquaman, and Martian Manhunter. The largest is Superman and the smallest is Martian Manhunter. Let the Justice League unite on your desk or on your shelf. This set is awesome and pretty adorable. This set is only $34.99(USD) from Entertainment Earth.